In 1881, American entrepreneur and industrialist Joseph Wharton established the world’s first collegiate school of business at the University of Pennsylvania. In 1972, the Wharton School of Finance and Economy changed its name to the Wharton School of Business. In 2001, the West Coast MBA Program for Executives — Wharton, San Francisco—was established. Wharton, San Francisco is located in the historic Hills Brothers Plaza, at the base of the Bay Bridge, overlooking the San Francisco Bay. Students find a wealth of employment opportunities in the thriving business region surrounding the campus. The plaza is located around 20 miles away from the San Francisco International Airport. Hills Plaza classrooms are designed to deliver the leading-edge, technology-rich environment that is a hallmark of the Wharton School, and incorporates state-of-the-art communications technology with video conferencing and immersive communications capabilities. In addition to serving instructional needs, the 150-seat classroom and two 75-seat classrooms serve Wharton alumni and wider business communities as the venues for a wide range of events and programs. Wharton’s 235-plus professors generate the knowledge and innovations that transform global business practice and public policy. Drawn from 10 academic departments, they work with leading companies and policy-makers around the world, and they bring that real-world, real-time knowledge into Wharton’s classrooms. Many members of the faculty travel between the original Philadelphia location and the San Francisco campus every week. The Wharton San Francisco Executive MBA Class of 2019 enrolls 224 students, which are 35-years old on average. About 25 percent of the class are female and the average amount of work experience per student is 11 years. Unlike its sister school in Philadelphia, the Wharton School of Business of San Francisco exclusively offers the Executive MBA. 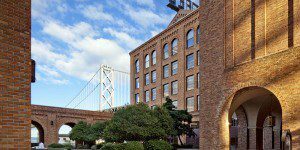 What Are The Right San Francisco Executive MBA Programs For You?